During the winter, Denver is a popular town. You’ve probably already experienced how eager friends and family are to show up to take advantage of the great skiing and other winter outdoor fun. Entertaining guests is always a lot of fun and that fun can be enhanced when you invite those folks into a hot tub. 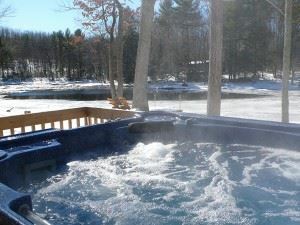 It might seem strange to your visitors to ask them to trudge across the snow to get into a hot tub but once inside those inviting waters there won’t be any complaints. If you don’t have a hot tub in your backyard you’re missing out on a lot of pleasure. Perhaps there’s an old hot tub left over from the previous owner that hasn’t been used for years. Instead of it becoming a huge birdbath why not consider getting rid of that hot tub and replacing it with the new model? Shopping for a hot tub is not unlike shopping for a new bed: comfort is key. As you visit hot tub showrooms you’ll have the opportunity to actually crawl into a hot tub albeit one without water. While you might feel ridiculous sitting in an empty hot tub fully clothed it’s really the best way to assess how comfortable you’ll be once this town is installed in your own backyard. Forget feeling silly! You want to make sure you’ve got room to float in. Another important factor in shopping for a new hot tub is the level of hydrotherapy performance you might be getting from your new tub. This will come in the form of jet placement. Once again you just can’t beat getting into the hot tub to see where these soothing jets of bubbles will be massaging your body from. You should also check out how easy it is to make adjustments with these jets. Many new hot tubs are remote control which is perfect for Denver winter. You can literally turn on the hot tub, heat up the water and get those jets going all from the inside of your home. The moment you see steam rising off the hot tub you know it’s ready! Your new hot tub should also be easy to take care of. It could be that the old hot tub sitting in your backyard was too cumbersome to keep up which is why it was left to ruin. A new premium hot tub will have a circulation pump that will continuously filter the water and provide the necessary flow for the heater to set the desired temperature. Of course, before that new hot tub can be installed you need to break down and get rid of the old one. This task can be easily taken care of when you hire a crew of professional junk haulers like Junk King Denver. The hot tub will need to be broken down into several components and then loaded onto a truck. This is definitely a multiple-man operation that will require heavy lifting. You don’t have to feel guilty about using professionals for this job. All you need to be thinking about is how great it’s going to be when you can start using your new hot tub! This entry was posted in Denver Furniture Disposal, Denver Hot Tub Removal, Denver Junk Hauling, Denver Junk Removal and tagged Denver Hauling, Denver Hot Tub Disposal, Denver Hot Tub Removal, Denver Junk Removal, Get Rid of Old Hot Tub on February 29, 2012 by Paul Durant. Last updated August 1, 2017 . The best time to buy a new mattress is over a long holiday weekend. Typically, this would mean weekends like Presidents’ Day, Memorial Day, Labor Day or Fourth of July. Truth be told, most mattress dealers would love to have you buying mattresses from them throughout the year. Buying a mattress in many ways is like buying a car. It’s an investment that you’ll be hanging onto for years to come. In fact, you might actually hold onto your mattress longer then your car! Actually the recommended lifespan of a mattress is 5 to 8 years. Beyond that time you’re not getting the full benefit from what was once a firm mattress. If you follow those parameters and go shopping for a mattress this weekend then perhaps you haven’t been mattress shopping in eight years. If so there’s a lot for you to consider. Picking the right mattress comes down to a matter of personal preference: if it feels good then it can work for you. There are two types of mattress to pick from: an innerspring or a foam mattress. 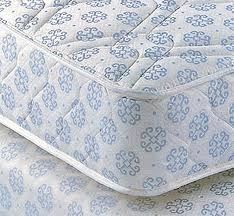 The innerspring mattress is the most popular selling of the mattresses. The support is provided by metal coils that are wrapped in fabric and then encased in cushioning. What might surprise you is that it’s not the number of coils in a mattress which make a difference but the gauge of wire that the coils are made from. The thicker the wire the more firm the mattress will become. Conversely the lighter the gauge the more your mattress will have spring. When you compare mattresses compare gauge wire size with how it feels for each type. A foam mattress is a solid mattress made up of fibers or synthetic material. Today many foam mattresses are referred to as memory foam. This means it contours to your body shape the same way every time you lay down on the mattress. Foam mattresses are genuinely more expensive then an innerspring mattress but that could provide you with more comfort throughout the years. Don’t look at the price of a mattress as a single investment but what you would be paying for good night sleep over the course of the next five years. There are some mattresses that are designed to be no-flip mattresses. This means it’s an innerspring with extra padding on the top. While it sounds like it’s a good deal it’s actually not recommended. Most mattress manufacturers suggest that you flip your mattress every couple of months to prolong the life of the mattress. If you have a no-flip mattress then you’re going to be stuck with a one-size-fits-all approach. As soon as you’ve settled on your perfect mattress you’ll make plans to have it delivered. At the same time you should also make plans to have the old mattress taken away. While it is true that some Denver mattress stores might offer free removal what they cannot offer is getting rid of some other junk at the same time. Professional junk haulers like Junk King Denver can take care of your old mattress and also get rid of any other items you might have taking up space in your home. Buying a new mattress could just be all the inspiration you need to clear out your junk! This entry was posted in Denver Furniture Pickup, Denver Junk Hauling, Denver Junk Removal, Get Rid of Old Mattress and tagged Denver Mattress Disposal, Denver Mattress Hauling, Get Rid of Mattress, How Do I get Rid of My Mattress on February 23, 2012 by Paul Durant. Last updated August 1, 2017 .